Credit: Katie Yu / FOX. 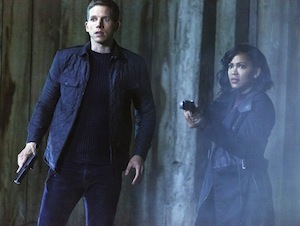 Tonight’s brand new episode of MINORITY REPORT is going into the pre-cogs’ backstory. In “Honor Among Thieves,” the series explores, via flashbacks, the immediate aftermath of the siblings being removed from the milk bath…and how they adjusted to the new world. And in the present day, Arthur and Vega need to work together on a case. So, naturally, some tension comes from that, as well.